Urgent call for solidarity with our dear friend S.
Published on July 13, 2017 in Uncategorized. Closed Tags: athens, death at border, farewell, friend, Infomobile, solidarity call, w2eu, Welcome Islands. We first met S. in December 2015, an 41-year-old woman from Uganda victim of torture in her country. She was waiting in the cold with hundreds of other refugees in the informal tent camp in Idomeni at the border to FYROM, the time when the borders started to gradually close, beginning with refugees who were not from Syria, Iraq and Afghanistan (non-SIA countries). Along with many others, she had the hope that the Balkan corridor would re-open for all and she could move forward and later re-unite with her family in a better place. We met her while she was cooking in a big casserole for the group of African refugees she was staying with. We remember her tired and sad smile of those days. Full of stress, she asked us what would happen to her and all the other people if the borders would not re-open. Who would help her if she had to stay in Greece, she asked. Who could support her two children, which got separated from their mother and who had at that time remained back alone in Turkey. When S. gave up trying to leave Greece and came back to Athens, we offered her a safe place to stay in the Welcome Island, a solidarity flat run by private donations as a grassroots project. She stayed for more than one year in the apartment, co-living first with people from Somalia and later from Afghanistan and Uganda. Sharing a room with women from another culture, who had their own problems and suffering, was not always easy, but S. was a strong, honest and faithful partner in this flat-sharing project and she has never hesitated to help others or to give us a smile. She brought to the flat her friend who was in advanced pregnancy and alone and supported her to stay in the house and get help. For months she tried hard to find a job in order to support her family. During the whole period of stay S. suffered not only from her very serious health problems and trauma as a victim of torture, but specifically from the separation from her children. She was supported by friends and volunteers, as well as the Greek Refugee Council (GCR), Medicines Sans Frontiers (MSF), and Babel Day Care Centre until her very last days – even until today. Tragically, S. finally lost her courageous struggle and died in the early morning of 12th July in a hospital in Athens. Now, we want to say goodbye in dignity and help her on her last journey back to Uganda, where her children have returned to. Her beloved ones, as a last wish for their mother, asked her body to be transferred and buried close to them in Uganda. GCR made a solidarity call to collect the amount of 2,100 Euro for the purpose of the transfer of the corpse back home to Uganda. We would like to call for solidarity also from our side and ask you to support the family of S. on these last steps. She never reached her destiny; she could not fulfill her dreams. We want her to be in the arms of her family finally, that this personal fight against the monster Fortress Europe ended for her in Greece. Stand by the side of this family now so that S. can reach her children and they can say a last goodbye. Her corpse needs to be transferred soon, so any solidarity is urgent. You will be our good friend always and in our hearts forever! Published on November 15, 2012 in Uncategorized. Closed Tags: antifascism / antiracism, germany, greece, Infomobile, interview, racism, refugee stories, report. Published on April 12, 2012 in Syndicated. Closed Tags: border deaths, deportation, detention, EVROS, ferres, fortress europe, fylakio, greece, Infomobile, killing borders, migration policy, police violence, readmission agreements, report, repression, soufli, struggles and resistance, turkey, venna. Obviously, Europe’s main concern is the creation of »walls« in order to hinder or to prevent the access to its territory. Physical walls like the fence, the moat and border controls in Evros but also invisible walls that are constituted by the lack of protection to those in need, rights denials, systematic detention, detention and living conditions violating human dignity, Readmission Agreements and the Dublin II Regulation. The effects of these heightening walls have their most tragic face in the many lost and dead at border. 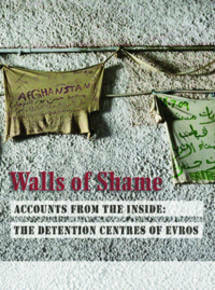 This is why we chose to speak about walls of shame in this report. Published on September 7, 2011 in Uncategorized. 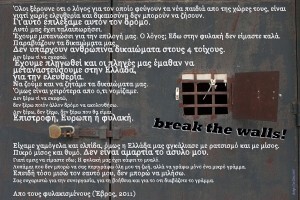 Closed Tags: EVROS, fortress europe, greece, Infomobile, killing borders, struggles and resistance. John lost his wife Jane and Tahera her husband Bashir in the Evros River. They represent hundreds of other migrants who drowned in the water, were killed by landmines or are still missing. Their dead bodies were treated disrespectfully: In 2010 we discovered a mass grave in Sidero where the corpses could not be identified. We returned to give back a piece of dignity to the dead and also those who survived. Published on September 4, 2011 in Uncategorized. 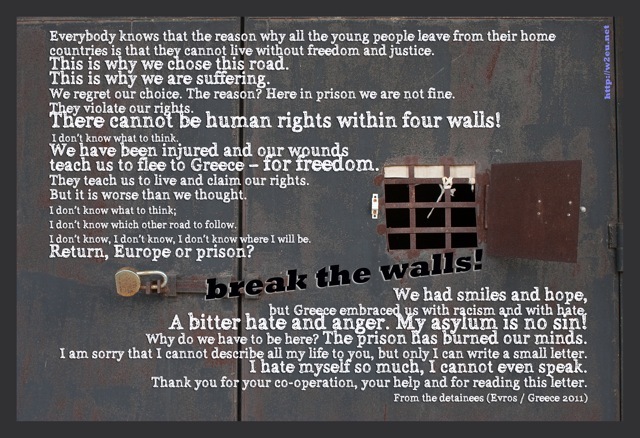 Closed Tags: fortress europe, greece, homelessness, igoumenitsa, Infomobile, patra, refugee stories, repression, sans-papiers, Sudan. Two refugees from Sudan talk about their lives in an emptied city. 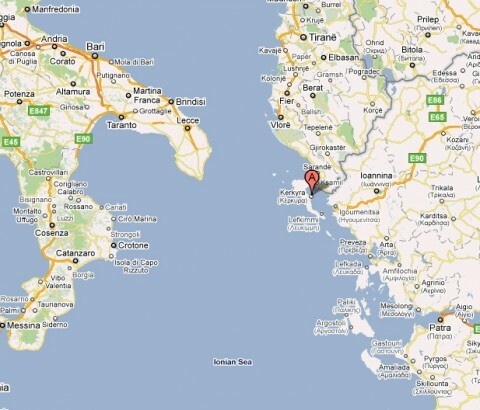 Patra has been the second exit-port after Igoumenitsa that the greek police raided in 2011. In the center of the city one cannot see any immigrants anymore. In repeated sweep operations the authorities destroyed a number of provisory housing sites and arrested hundreds of sans-papiers. 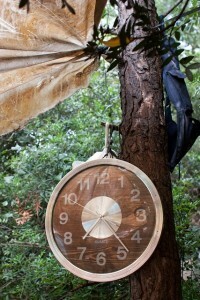 In the summer of 2011 only very few refugees remained at the rims of the city marginalised and displaced. Published on July 28, 2011 in Uncategorized. Closed Tags: afghan, border deaths, fortress europe, greece, igoumenitsa, Infomobile, kerkyra, refugee stories, sans-papiers. The following testimony of Amin Fedaii, a 16-year-old afghan refugee, is alarming. More than 20 refugees (mainly from Afghanistan) died while trying to flee from Greece and to reach their relatives and friends in other European countries. I felt very queasy, I was in the bottom of the ship and tried to sleep. I was not really sleeping I was so afraid. I was drifting away. Published on July 28, 2011 in Uncategorized. Closed Tags: death at border, EVROS, fortress europe, greece, Infomobile, interview, refugee stories. Jen got lost when she tried to cross the border to Greece. Maybe she drowned in Evros, the river between Turkey and Greece. We will mourn Jen and all the refugees that died during the attempt to overcome Fortress Europe on the 30th of August 2011 in Evros. We want to give back a piece of dignity, to those whose death disappeared — right here — into the senselessness of the European borders. And we will gather for giving back a piece of dignity to those who survived. We will create a memorial space. 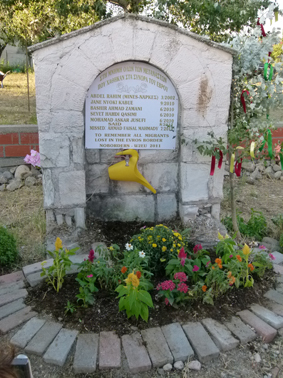 In the year 2010 more than 50 persons lost their lives in the border space of Evros. In 2011 the numbers of dead have reached already more than 20. The creation of a 12,5 km long fence in Evros that started in July 2011 will increase the danger at this border even more but it will not stop people from fleeing to Europe. Interview with John, Athens, 11.05.11. Published on June 1, 2011 in Uncategorized. 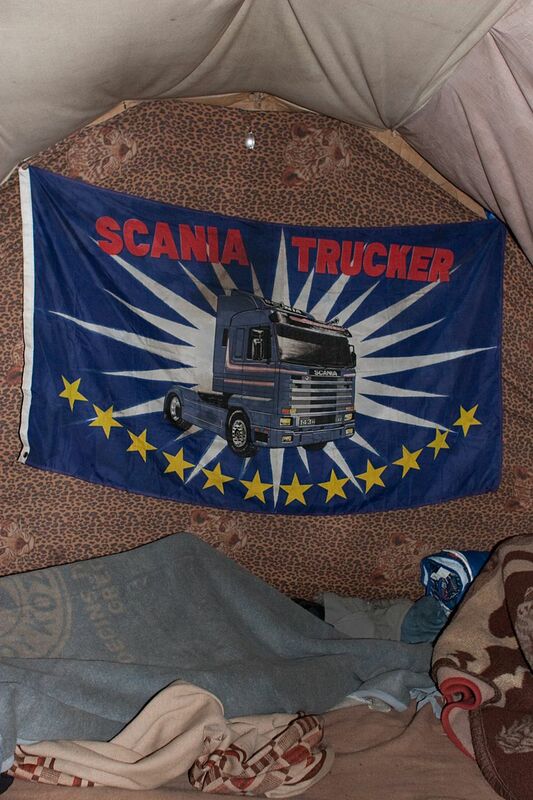 Closed Tags: Eritrean, fortress europe, greece, homelessness, igoumenitsa, Infomobile, interview, police raids, refugee stories, repression, sans-papiers. N. spent a very long time in the mountains of Igoumenitsa. With 10 months he belongs to the experienced men on the mountain. He has been deported from Italy several times. Still he never lost his hope that one day he will get out. “I promise to see you in a better place,” N. says and his eyes are full of energy. How long are you in Igoumenitsa? In Komunisia here? I have longer than ten months. More than ten months here! What did you expect from coming here to Igoumenitsa? You know, the reason for my coming to Komunisia, I am suffering too much bad in this country. I need to leave this country. For this reason I came to Komunisia. Unfortunately, during these days we are suffering from a very bad situation: from the police and from the racist people, from the civil society here in Komunisia. Published on June 1, 2011 in Uncategorized. Closed Tags: fortress europe, greece, homelessness, igoumenitsa, Infomobile, interview, police raids, refugee stories, repression, sans-papiers, Sudanese. A. and Y., refugees from Sudan talk about their living-conditions in Igoumenitsa, the second largest port from Greece towards Italy. We are sitting in the mountain, looking at the port-area of “Komunisia” how the refugees call it. A few hundred refugees from all war-zones of the world are living on this mountain. Some days ago, at the 3rd of May, the refugees’ settlements in the mountain have been attacked by fascists out of a demonstration. Afterwards the police drew an invisible ‘red line’ and prevented refugees from entering the city. More than 450 refugees have been arrested in May 2011 – double than the average monthly arrests of 2010. Police guards the garbage cans and so the refugees are starving from hunger. We are sitting on this mountain in Europe and we hope for their chance to go! Published on May 9, 2011 in Uncategorized. 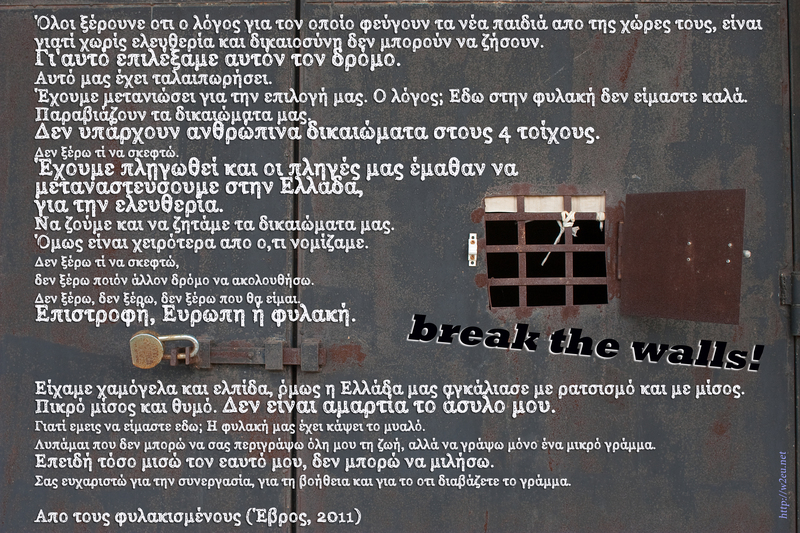 Closed Tags: detention, EVROS, greece, Infomobile, poster, refugee stories.